According to the current exposure news, Apple will release 3 new products in 2018, possibly named iPhone 9, iPhone 9 Plus, iPhone X Plus, Apple official has not confirmed this news, but there are mobile phone accessories manufacturers have launched iPhone 9, iPhone 9 Plus, iPhone X Plus accessories. 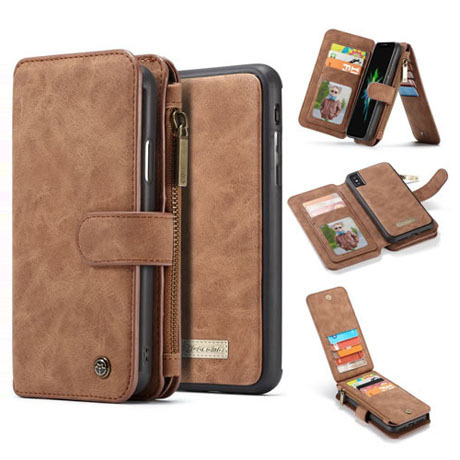 Let’s take a look at this best wallet case for iPhone 9 Plus. This CaseMe case is an ultra-thin detachable wallet case that ensures the security of your iPhone 9 Plus while eliminating the hassle of carrying extra wallets. It allows you to carry multiple credit cards and cash without any pain. The zip closure allows you to store coins, headphones, cash, etc. It’s uniquely designed to fully access the device’s screen and other important buttons and ports even when turned off. It is also compatible with Qi wireless charging. Its folio style design can withstand shock and protects your smartphone from scratches. If you don’t want an extra wallet, you can also separate the wallet and phone case. If you are interested in iPhone 9 Wallet Case, iPhone X Plus Wallet Case, you can check out the official website casemecase.com. Samsung Galaxy Note 9 will be released tomorrow, we will write a review about Samsung Galaxy Note 9 Wallet Case, you can pay attention to us.